Hello everyone, yet more Tomb Kings to show off today. I actually finished this unit of spear men about a week ago but just got around to taking pictures. 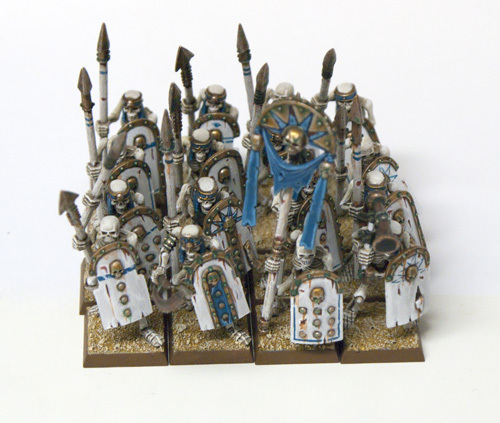 Slowly but surely this army is growing, now I just need to learn how to play Tomb Kings and 8th edition. Remember, this army I am just painting up to gaming standards, so nothing fancy on the rank and file, sorry. 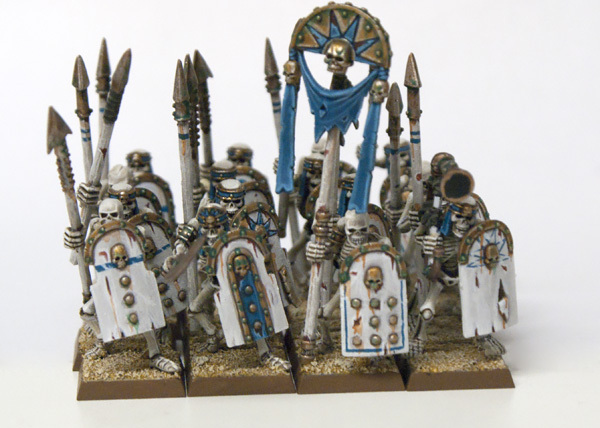 I am happy with their shields though, I think the white works well and it helps show wear and tare from being buried for eons . 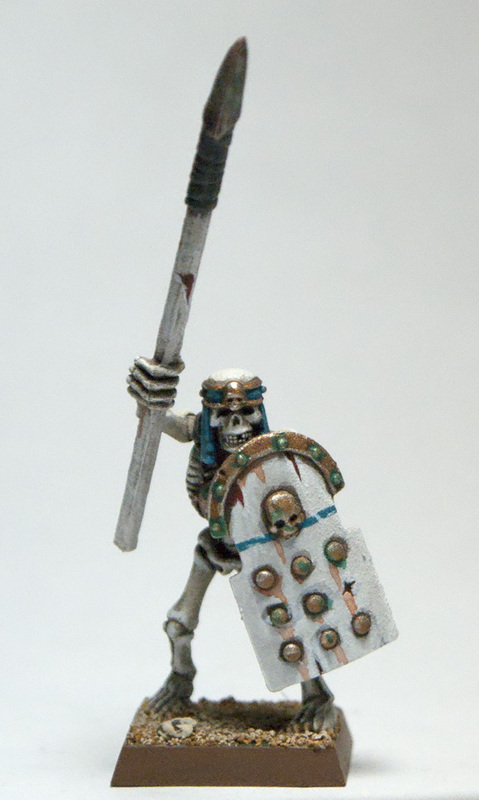 I'm hoping to eventually bulk this unit out to 40 strong since hordes seem to be all the rage now. 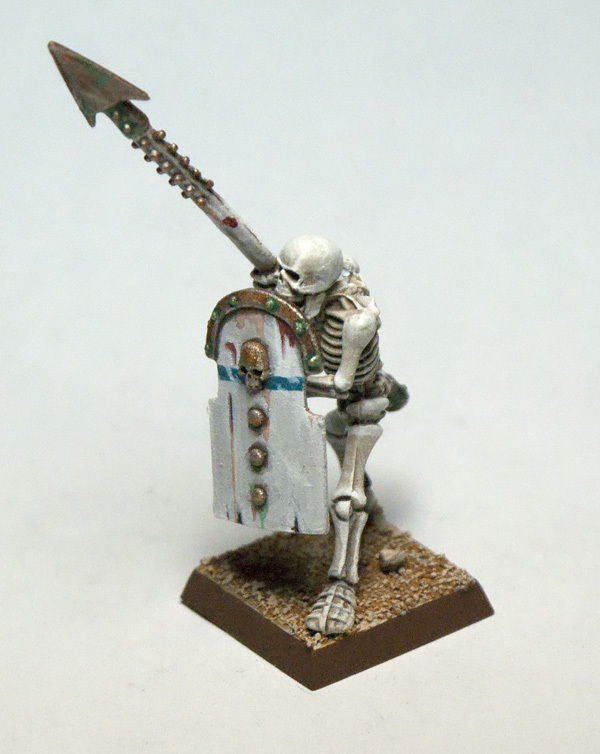 I am trying to think of interesting unit fillers I could make to cut back on the number of skeletons I'll have to paint but I am having some trouble. I want them to be interesting and add character to the unit, but to me when I think Tomb Kings I think rank upon rank of disciplined skeletons, so adding some statue or something into the middle doesn't gel in my mind. Any suggestions would be appreciated. I of course also took some pictures of the obligatory army shot. Next post I hope to have some pictures of commissions that I have been working on, so look for that in the next couple of days.